The DC area’s food scene continues on an evolutionary path. What was once deemed a simplistic food city now steadily attracts talent that is both local and home-grown, as well as talent from the stratosphere of JBF-affiliated chefs. (JBF = James Beard Foundation… but I’m sure you already knew that.) From legendary talents like Wolfgang Puck and Daniel Boulud, to JBF stars like Fabio Trabocchi and José Andrés – all, and then some, create an overwhelmingly brilliant framework for the city’s expanding culinary story. Just about 15 months ago, Michael White made his mark in the DC area with his Italian-focused Osteria Morini, which is situated in the up and coming Southeast waterfront area, The Yards Park, just outside the Washington Navy Yard. Trained in both the Unites States and Italy, the Midwestern-raised chef is known for his passionate and flavorful renderings of Italian classics. Osteria Morini, in particular, emphasizes the gastronomic heritage of Italy’s Emilia-Romagna region. This region is most known for some of Italian cuisine’s staple ingredients such as parmigiano, balsamic vinegar, and prosciutto. Probably the most notable feather in Michael White’s “chef’s cap” is his Manhattan jewel, Marea. Marea has garnered JBF accolades and Michelin stars, and continues to wow New York City’s food-faithful. His first Osteria Morini opened in downtown Manhattan in 2010. And several years later, and with more restaurants opened in and outside of the U.S., Chef Michael brought his food-fanfare to Washington, DC. The restaurant itself is a pearl of casual fine Italian dining in the bourgeoning neighborhood that’s also home to Nationals Park. With a lively atmosphere, and a great wait-staff to match, it is a great place for anything from a family dinner to a casual “date night” –and everything in-between. The food is hearty and bounds with a piquancy that won’t necessarily leave you feeling “heavy” as many an Italian meal may have made you feel in the past. In fact, portions are perfectly appointed. During a recent visit with friends, our dinner experience kicked-off with a spread of cured meat and cheeses –all of which is now a delicious blur… probably due to the on-going table conversation we were all engaged in. When our main dishes made it to the table, we were ready for more. Two opted for the lasagna verde –composed with a ragu antica, béchamel and parmigiano. Another friend went for the gramigna –a carbonara with pork sausage and pecorino. 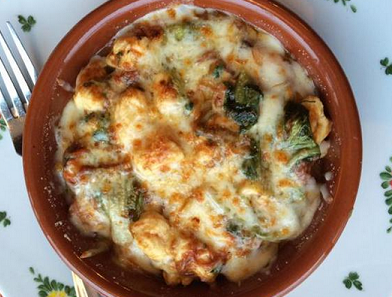 I ended up choosing the cicatelle al forno, a baked gnocchi dish made up of duck ragu, escarole and scamorza. Incidentally, the cicatelle is on ZagatDC‘s list of “pastas to try now.” The coincidentally pasta-themed dinner (which was not planned out-right), though piled with its share of sauces and cheeses, was not at all overwhelming – and I mean that in a good way. The tastes were almost delicate, but packed with enough zest to keep you engaged till the last bite. The baked gnocchi, for instance, was perfectly cooked –al dente and not drowning in sauce; the delicious duck ragu serving as the heart of the dish. Thankfully, we spared room for dessert. While I gave up baked cakes and pastries for Lent, I happily opted for an affogato –Morini’s version nicely made with amaretto gelato and freshly brewed expresso. It was the perfect end to my first Osteria Morini story. My friends each went for the agrumi (ricotta cheesecake), tiramisu (lady finger “cake” with mascarpone mousse and coffee crema), and riso (praline rice pudding). The good thing was that we weren’t hauled out of the restaurant in stretchers or wheelchairs, which – in my mind – only means that the dining experience was simple, perfect and not at all over-done. Though the restaurant is in an arguably “sleepy” part of the new-ish waterfront area, there is definitely more to come in terms of development. And it is a quick walk from an ice cream shop, a brewery and sports bar among other things. The restaurant definitely stands out for its offering and caliber of food in the area. And while the DC area brims with Italian restaurants –both good and not-so-good– Morini definitely hits with high noteworthy marks. Oddly, I found the bar area lacking somewhat in character and space, but it is clear that this is a place that’s meant to be experienced in the dining room, where food is meant to shine and be relished. The dining space is expansive with calming brownish hues, and encourages a casual air. The hums of conversations float all around the room, and serves as a lively backdrop to a taste-worthy food experience. Osteria Morini is surely an Italian place not to miss out on. And if you haven’t made your way to the Capital Waterfront, then let this place be a reason for you to get there.